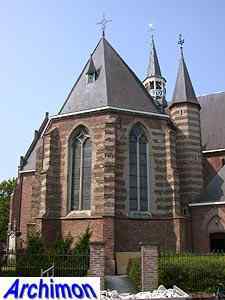 This Gothic, three-aisled cruciform church with pseudo-basilican nave was the successor of a Romanesque church from the 12th century. Starting in ca. 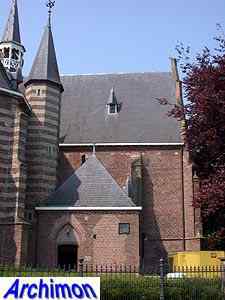 1422 that previous church was gradually replaced. 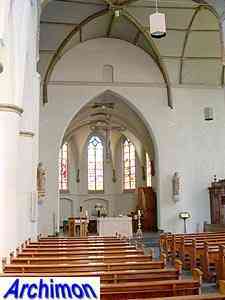 First a new nave was built. Ca. 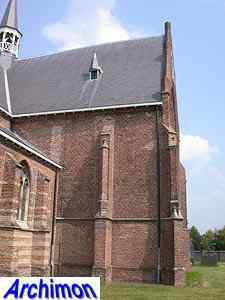 1525 work on a new choir started, which was built with the use of tuff taken from the old church, as well as brick. The two materials were used in layers. 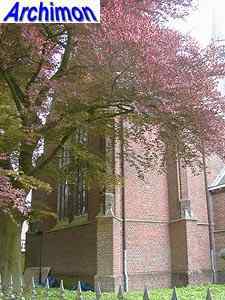 Shortly after that the transept was built. 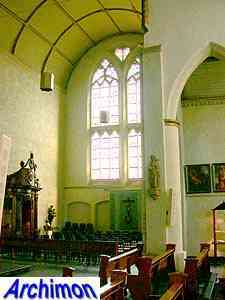 The side-aisles were widened and lengthened to run along the Romanesque tower, which was retained. 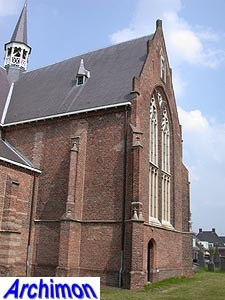 To the northern side-aisle two gables with windows were added. 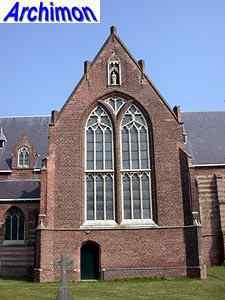 The windows on the south side are higher. 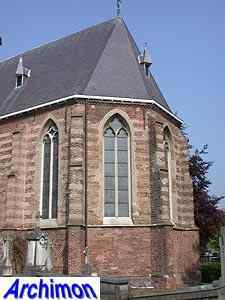 Small dormer-windows on the roof illuminate the central nave, this is probably a later addition. 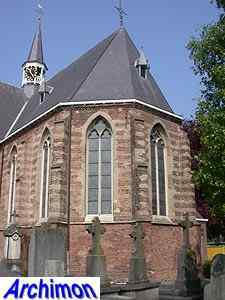 In 1798 the church was returned to the catholics. 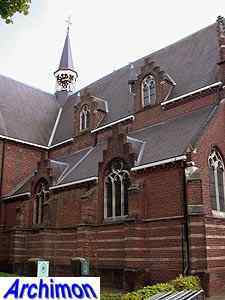 A relatively early restitution, the result of an active lobby by the parishioners, despite the opposition of the local priest who regarded the building as desecrated after 150 years of protestant use. It also must have been in a very bad state. 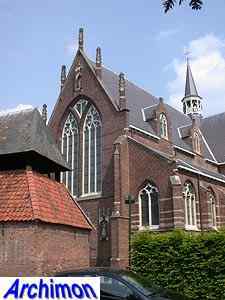 But it was the parish's wish to use the church, and a year after restitution, after the most essential repairs had been made, the first mass was held. A real restoration was carried out in 1888-1893. 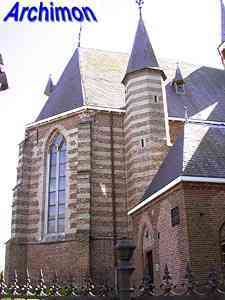 Architect C. Franssen cleant the walls of the choir, showing the contrast between brick and tuff, and adding new traceries to the windows, as well as pinacles to the gables. 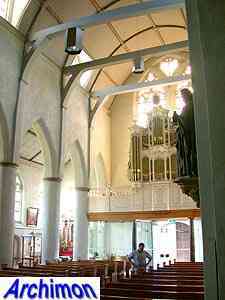 The stone vaul of the choir, which had been replaced by a plaster one in 1850, was rebuilt. 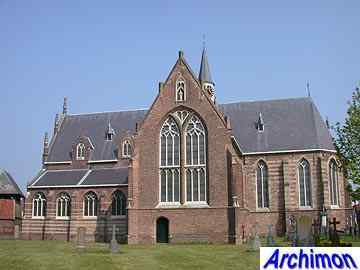 More important,Franssen lengthened the nave with two new traves and gave the church a new facade. 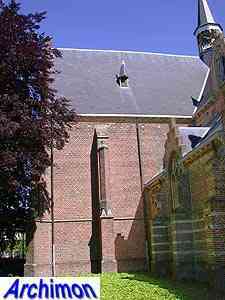 To compensate for the lack of a tower, the stair-turret next to the choir was heightened and given a new spire. 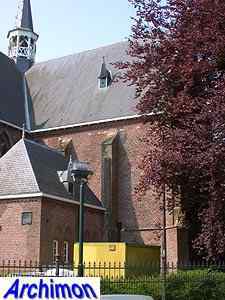 In 1965 the church was abandoned for a new one, and fell into decay. 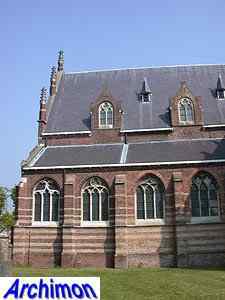 In 1975-1977 it was once again restored, which among other things resulted in the loss of most of the pinacles Franssen had so generously added to the gables. 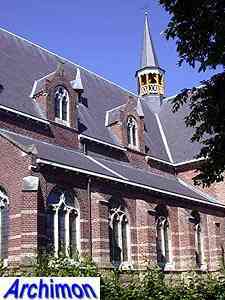 In 1994 the parish returned to the old church, which is now also used for exhibitions.